In the beginners tutorials on this website, we use a nine volt (9V) battery with the breadboard circuits. 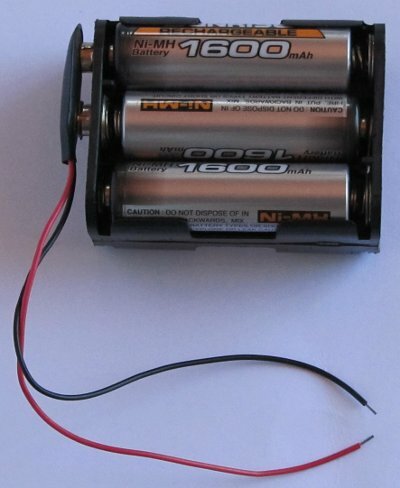 A single 9V battery or a battery holder containing six 1.5V cells can be used. 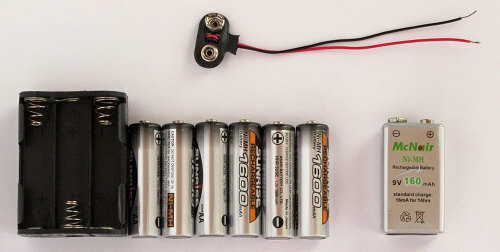 Either of these batteries needs a battery clip (connector) which has two wires for connecting the battery to the circuit. The red wire of the battery clip is the positive lead and the black wire is the negative lead. The battery symbol shown below is used to represent a battery in circuit diagrams. The longer vertical line of the battery symbol represents the positive terminal of the battery and is usually marked with a plus sign (+). The negative terminal of the battery must be connected to the part of the circuit that is marked negative with either the battery symbol, or 0V or GND. 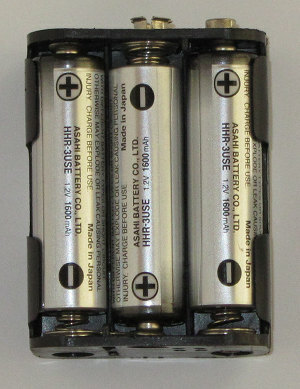 The battery clip connects to the two battery terminals – it can only go on one way around. Leave the battery clip off the battery when not in use so that the wires don't touch together and short the battery out. Be careful of putting the battery into a container that contains any conductive objects as they may short the battery terminals together. 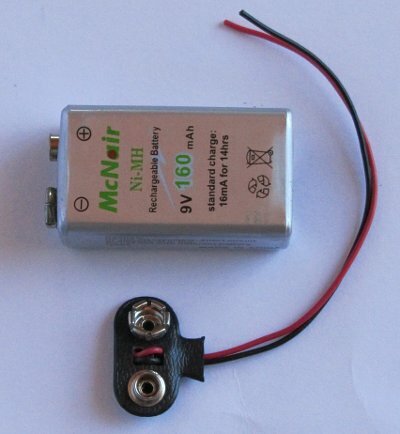 Buy rechargeable batteries and a battery charger. If there is no exposed wire at the end of the two battery leads, use side-cutters to remove some of the insulation so that the battery can be connected to a breadboard circuit. The video below shows how. When using the side-cutters to remove insulation, don't apply too much pressure on the side-cutters that you end up cutting through the copper conductors. Practice on some old wire first so that you don't make the leads of your battery clip too short if you cut through too many times. Apply just enough pressure to cut through part of the insulation and then hold the pressure when you pull the plastic off.